Like many parents of international students from China, she wants him to do well at school first and work later. 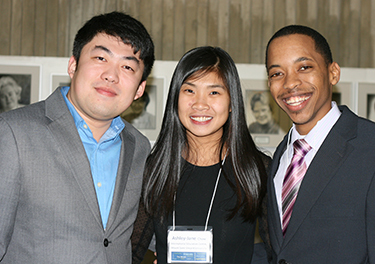 Harry Tian is a finance and accounting major at Mount Saint Vincent University. Tian arrived from China five years ago. He came on his own at the age of 19 to learn English and study. However, many international students are not getting Canadian work experience — a loss to them and Canada. It’s a situation that’s worrisome, according to panelists at a discussion on diversity in the workplace last Friday. Both international students and employers gathered to discuss how international students can bridge the growing gap of workers in the Nova Scotia job market. “We need young skilled professionals,” says Elizabeth Mills, executive director at the Nova Scotia Office of Immigration. She adds that immigration into Nova Scotia and retention of these immigrants is essential to filling this gap. Mills warns that “the demand for workers will sharply outstrip the supply by 2015,” and this employment gap could be anywhere from 2,800 to 8,000 workers. But while Canada doesn’t have any difficulty attracting immigrants, most settle in the larger provinces. Of the 8,000 internationals students currently studying in Nova Scotia, only 1,900 of them have applied for work permits. Mills says encouragement is needed to entice international students to apply for work permits to help them gain important Canadian work experience while they’re studying here. In turn, after students have availed of the one to three year work permits, they can then apply for Canadian experience class visas and apply for permanent residency. Prior to his job at Citco, Tian had devoted all of his time to his studies and had never had a resume or a job. He’s now in his second four month co-op term and has made a real impression at work. Ramona Lumpkin, president and vice-chancellor at MSVU was in contact with Tian’s employer who wrote to her saying, “what a wonderful employee Harry is.” It’s a very direct experience, she says, as to how the university can help international students prepare for employment. Tian says he’d like to stay in Canada but may go to the U.S. to fulfil his “dream job” of working in finance in New York city or New Jersey. Tian says the North American quality of working together as a team is a more efficient way of operating a company. The Nova Scotia Office of Immigration and Immigration Settlement and Integration Services found the three main reasons internationals students left the province was because they could not find work in their field of expertise. Other reasons were feelings of isolation and the need for increased access to language and learning programs. “We’re trying to build a province based on young, diverse and skilled people,” says Mills, who also referred to Nova Scotia’s aging population as one contributor to the upcoming gap in the workforce. Students speaking at the diversity workshop spoke of the increased need for employers to help international students settle into the the workplace. Barry recognizes that Nova Scotia is slow to accept diverse cultures and employees with diverse backgrounds. She says MSVU offers students free language tutorials and support throughout their time at the school. Ashley-Jane Chow, a student advisor to MSVU international students, says part of the difficulty for international students is that they come from a “collectivist culture, that puts the need of the culture before the individual.” Chow says international students can feel very uneasy approaching supervisors and speaking-up in the work environment. She says many international students find it disrespectful to call their employers by their first name. Barry says employers need to recognize these cultural barriers and see the value international students can offer their companies like a “really great work ethic.” She says multi-lingual skills, international experiences and loyalty are all valuable skills these students can offer employers. International students can also help employers meet the needs of their growing international client-base, says Barry. Glen Dormody, RBC Royal Bank’s Regional Vice President says he was impressed with the dialogue workshop and says their branches are making concerted efforts to hire international students. Dormody says the Larry Uteck branch is one of their fastest growing and diverse branches, serving a diverse client base.